Ride and Read! NEWS by Madness Photography - Onno "Berserk" Wieringa: 2013 AMD World Championship of Custom Bike Building World Champion ring design! 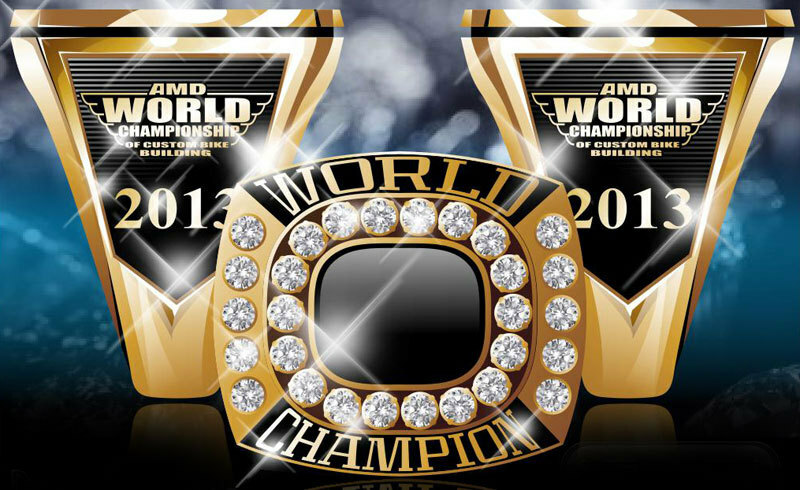 2013 AMD World Championship of Custom Bike Building World Champion ring design! Here it is - the 2013 AMD World Championship of Custom Bike Building World Champion ring design! AS at March 25th there are 98 builders from 23 countries registered to enter 126 bikes in total at Essen, Germany, for the 10th annual AMD World Championship - the first to be held in Europe at its new permanent host event, the BIG BIKE EUROPE expo. Having made a final increase in the available space for World Championship bikes, there are now only 30 more bike spaces available. And it isn't only Championship bike space that is in short supply! BIG BIKE EUROPE looks like it will be be the largest V-twin industry gathering of the year in Europe, and one that is sure to grow rapidly in the years ahead!